We all know sugar is bad for us, so why can't we stop eating it? A Gut Feeling gives a personal and scientific look into the world of microbes that live within our bodies and how they can explain our relationship to and cravings for certain foods. 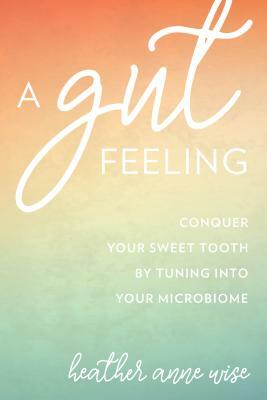 Heather Wise takes the reader through a hidden inner world of microflora that shapes our mood, physical health, sweet cravings, and even genes. She makes us question whether a diet high in sugary, processed, dead foods--devoid of any microscopic life--may be causing us to feel sick, tired and depressed. The microbiome is emerging as the answer to many of our most sought after questions. Using her own story and the science currently available, Wise provides a window into the latest research on the vast world of microbes in our bodies. She explains in simple terms how what we eat can change the expression of our genes and how this symbiotic relationship between microbes and human cells can determine our health. This understanding sheds light on the fact that the genetic makeup of our bodies is more malleable than we could have ever imagined. Wise's book gives us the opportunity to transform our health for the better by mindfully eating foods, herbs, and teas that improve the health of our microbiome, and cutting down on the foods, medications, and chemicals in our environment that are diminishing beneficial microbes in our delicate inner ecosystem. A Gut Feeling offers practical steps to rebalancing and healing our gut microbiome to relieve stress, digestive upsets, inflammation, bloat, excess belly fat, and improve mood. Wise offers a needed alternative to the complex world of fad diets and calorie counting in this easy, evidence-based guide for wellbeing. Rooted in scientific research and providing a number of healthy sweet fixes high in prebiotic and probiotic foods that support the growth of healthy gut flora, this book is a practical guide to help heal our relationship with food and tune into what our gut has been trying to tell us. Heather Anne Wise, MPH is a certified holistic health coach, wellness consultant, herbalist and avid food fermenter. Founder of Smart Palate wellness coaching, she has given a number of workshops and talks on gut health and well-being, including at Harvard Medical School. Heather lives with her family in the Boston area.